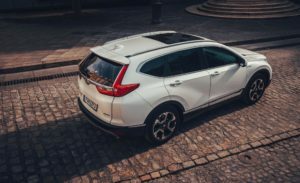 Available with five seats only in eCVT with a choice of two and all-wheel drive, the hybrid version of the CR-V follows the standard Honda grading rising from the entry level S to SE, SR and finishing at the top of the range EX. As with the petrol version, standard across all grades is Honda SENSING; Honda’s suite of safety features which includes collision mitigation braking system, forward collision warning, lane keep assist, lane departure warning, road departure mitigation, adaptive cruise control and traffic sign recognition. SE grade adds parking sensors and a rear view camera, while the SR and EX will also feature blind spot warning and cross traffic monitoring, while low speed following on the cruise control is available across all grades. SR grade also adds smart entry and start, leather interior and active cornering lights; while EX further includes a heated steering wheel, head up display, hands free access power tailgate, heated rear seats and panoramic glass sunroof.